If you like it really hot, increase the amount of Thai chili paste. Substitute Indian curry paste, if desired. Ready, set, EAT! Combine curry paste, ginger and vegetable oil. Grill breasts about 4 minutes per side or until juices are clear. Combine wasabi and water together to make a paste. Stir in ginger and soy sauce. Brush wasabi mayonnaise on each half. 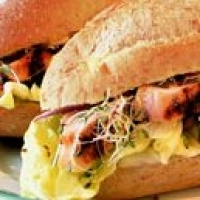 Slice chicken breasts into 1/4-inch slices and place over mayonnaise. Add red onion, sprouts and lettuce leaves. Sandwich with top half of roll.